We haven't done one of these in a while so here is a catch up of a few crackers lately. "Will they have Prosciutto Ham, Nanny?" On a browse through the holiday section of the weekend paper I said "Oh boring golf holidays". At which point princess C said "Oh great I like golf holidays!" Nobody in the family plays golf so this stumped me and decided to quiz further about this golf holiday she had been on. 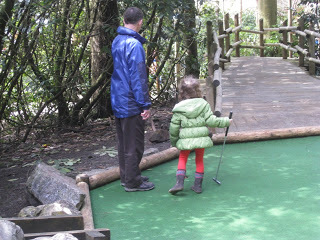 "At Centre Parcs of course, we played crazy golf and it was brilliant" was the response. Lovely Auntie came for a visit and was telling Princess C a bit of a naughty joke about a girl doing handstands. "When she went home to tell her mummy, her mummy said but all the boys saw your knickers. Next day girl does handstands and when the mother questioned her about the boys seeing her knickers she said she wasn't wearing any". Princess C within a bat of an eyelid replied "she should have worn tights". No flies on Princess C!